Twilight finds out she pregnant, and has a pretty good idea who the father is but won't tell anyone. Why? Canterlot, beautiful, majestic, peaceful, strong. This was all true un tell corruption ravaged the land, the tree of harmony did the only thing that could stop this. Using all it's power the land was born anew. I love these story's maybe you will like them too. This is me. If you need any editorial help, I'd be happy to oblige .. if that's okay with you. Thanks for joining Fluttermom! This is the first group I've made and I'm always really happy when new people join. If you have any thoughts or suggestions to improve our group, don't hesitate to say so in the comments or send me a message directly. 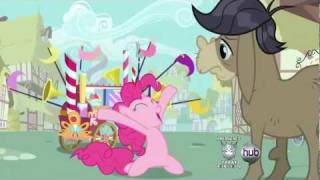 Now here's Pinkie Pie with your "Welcome Wagon"
I'm new at this so pleas bare with me and to all that enjoy my story's thank you. Though I am going to work on grammar. And if you want to work on a story with just send a message. Enjoy my story's and let me know what you think.